If you have ever dealt with other human beings then you have probably ran into a difficult person or two. Whether it’s a co-worker, employee at a shopping place, friend or even family members, the more people you interact with, the more difficult people you will encounter. These are the people who push your buttons. They can be rude, inconsiderate or condescending. They make you want to pull your hair out, or even worse pull their hair out. I interact with a large number of people on a daily basis. Most of my interactions are online or on the telephone as I work from home. I have dealt with more difficult people and interactions online than I ever did when I worked outside the home. Communicating online with people adds a bigger layer of frustration when difficult situations arise. No matter how or where you are interacting with others, it is important to learn practical ways to deal with difficult people so you don’t lose your temper or ruin your own reputation. 1. Think before you speak or type. “When angry count to ten before you speak. If very angry, count to one hundred.” – Thomas Jefferson. Remember that you can’t take something back once it’s been said. “Speak now, apologize later” really doesn’t help. People do not forget harsh words, even if they are able to forgive the person who spoke them. This is even more important when communicating online because your words are forever recorded in that email or Facebook comment or instant message. 2. Realize it’s not about you. 3. Be patient, no one is perfect, not even you. “Our patience will achieve more than our force.” – Edmund Burke. Extend grace to others just as Jesus Christ extends grace to us even though we do not deserve it. You have no idea what may be going on in someone’s personal life. They may be dealing with some very difficult situations of their own. Show others patience and kindness as you would like them to do for you in the same situation. Remember that no one is perfect. You will get a much better reaction and gain a lot more respect from being patient with others than by being demanding. 4. Consider the fact that you might be the difficult person to deal with in the situation. That’s a tough one to chew on isn’t it? Think about your own actions, words, re-actions and attitude. Is the problem really the other person? Or are you being difficult and making things worse for everyone involved and the entire situation? Take a step back and see what you can do to improve yourself before you complain about or try to improve others. No matter what career you are in, how big or small your family is or where you live, you will find difficult people in all walks of life. Learning how to deal with them can help ensure that you don’t turn into one of those difficult people others have to deal with. 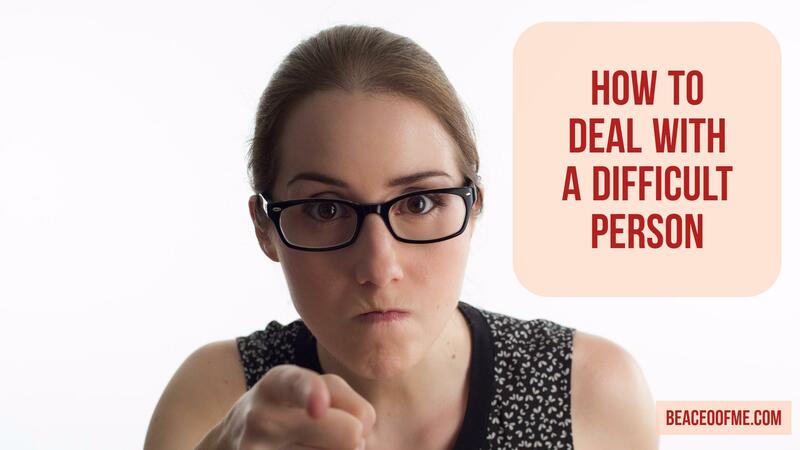 Do you have any other tips on dealing with a difficult person? Share below and if you enjoyed this post, I would appreciate if you shared it. Thank you! I love the Thomas Jefferson quote!